Glory Solomon, a young widow, holds tight to her memories while she struggles to hold on to her Central California farm. 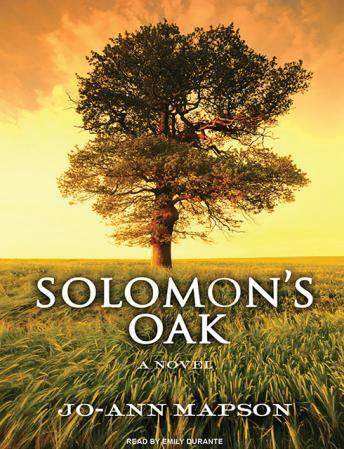 She makes ends meet by hosting weddings in the chapel her husband had built under their two-hundred-year-old white oak tree, known locally as Solomon's Oak. Fourteen-year-old Juniper McGuire is the lone survivor of a family decimated by her sister's disappearance. She arrives on Glory's doorstep, pierced, tattooed, angry, and homeless. When Glory's husband, Dan, was alive, they took in foster children, but Juniper may be more than she can handle alone. Joseph Vigil is a former Albuquerque police officer and crime lab photographer who was shot during a meth lab bust that took the life of his best friend. Now disabled and in constant pain, he arrives in California to fulfill his dream of photographing the state's giant trees, including Solomon's Oak.